It is possible that you have eight eyes like a spider or you are simply a multitasking person who would like to “watch multiple videos at once” on your screen; you would probably find Video Tile application a great idea, but, in fact, this application only pretends to be “all that.” We have found that this program has only one real function, and that is to display potentially unreliable third-party advertisements on your screen when you go surfing the web. Therefore, not only are these ads very annoying and disruptive, but they may also put your virtual security at risk. Keeping this ad-supported program on board would be a big mistake that comes with a price. You need to understand that simply closing pop-up windows and trying to avoid clicking on banners and other types of ads will not stop this adware from introducing you to potentially dangerous web content. Therefore, the best you can do to protect your computer from further infections and other system security issues is to remove Video Tile as soon as possible. This adware was built on the infamous Injekt engine. We have discovered that this application is a simple clone of Bronze Aid, Discovery App, High Stairs, Wander Burst, and many more. You can find the descriptions of all these adware programs on our website. This application claims to enable you to “monitor multiple video feeds at once in a clean display”; however, its presence will only make you annoyed by the third-party ads and shopping offers it shows you while you are browsing the web. We have noticed that this adware connects to videotile-a.akamaihd.net and other similar servers to load ads. You need to be very careful around third-party ads because there is no telling which ones you can trust and click on, and which ones you should avoid. If this or any other adware is present on your computer, it is also a possibility that otherwise legitimate third-party ads may redirect you to potentially dangerous websites. That is how it is possible that you are visiting a reputable website, such as YouTube and eBay, and clicking on an ad there might take you to an infected site. This is definitely one of the main reasons why you cannot keep adware applications, such as Video Tile, on your system. If you do not want to end up on malicious, fake websites and get scammed by criminals, we suggest that you delete Video Tile right away. 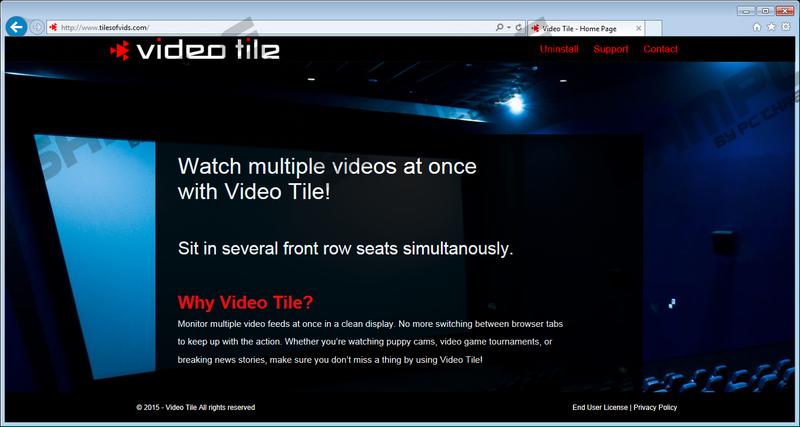 Although this application does have an official-looking web page, tilesofvids.com, you will get disappointed as soon as you realize that you cannot even download this tool. Yes, you read it right; no download links, no buttons on this page. “So how on earth is this adware spreading?” you may ask. And we would reply: “Just like all other adware programs – in freeware bundles.” Unfortunately, these bundles can contain a number of malicious software installers along with legitimate free software. Installing such a software package always requires your attention to be aware of what you really allow onto your computer. If you want to protect your PC from such malicious bundles, you need to avoid visiting suspicious file-sharing websites. Landing on an unreliable freeware site, for instance, can trigger new tab pages to open with malicious content, or expose you to unsafe third-party ads disguised as download buttons or Windows dialog boxes. Clicking on any content on unfamiliar pages could lead to downloading a bundle of malware infections. If you are uncertain about the possible malware situation on your PC, there are a couple of things you can do. First, you can skim through your list of installed programs in Control Panel and the list of extensions in your browsers in order to see if you can spot any suspicious applications. Second, you can also check the running processes in Task Manager to see if there is anything shady going on in the background. You can either use our search box at the top or any reliable search engine, such as Google, to find information about any software you may find suspicious. But, of course, you can also run a free online malware scanner that will automatically detect all the problematic applications. Only, make sure that the one you are about to use is reliable, not to end up with more issues than you may already have. We believe that you understand the importance of removing not only Video Tile but all other infections as well that you may find on your computer. We have prepared instructions for you below if you want to go after this threat by yourself. You have two options here: first, you can run the uninstaller through Control Panel and second, you can manually remove the related Windows Registry key, folders, and files. However, when it comes to modifying the registry, we only recommend it to more experienced computer users, since even a tiny mistake might result in major damage to your operating system. If you prefer automated solutions, we suggest that you download and install a reliable malware removal tool, such as SpyHunter. If you keep this security software regularly updated, it can provide your PC full protection from all malware infections known today. But it is just as important to keep all your programs and drivers up-to-date as well. Press Win+R and enter regedit. Press the Enter key. Locate %AppData%\Mozilla\Firefox\Profiles\. Enter the profile folder and then enter the “extensions” folder. Delete the file named firefox@www.tilesofvids.com.xpi. Quick & tested solution for Video Tile removal.